joy magnetism: "Never in the field of human conflict..."
"...was so much owed by so many to so few." I must have started this magnetpost a few times, on a couple different days, but since @stephenfry (#ff, if you don't already) Tweeted about the 1940 Chronicle, I figured this particular magnet works for any day this week. Forty years ago around this time, the London Blitz was in full swing, and I honestly can't even imagine how that felt. Imagine, every night, going to bed, knowing that the Luftwaffe was headed your way, and being powerless to stop it. The chronicle keeps you up to date with what happened forty years ago each day, related to readers as newsreports from correspondents and diaries. Such a great idea, because it gives today's audiences a better context to learn history. Despite the fears of the people, they must have felt a little better knowing the Royal Air Force was bravely defending the skies and warding off the Germans. Mind you, this four-month Battle of Britain (celebrating its 70th anniversary), fought mostly in the air, is considered one of the turning points of the war. The RAF successfully defended the UK from German invasion. Which brings us to the point of the 1940 Chronicle. Without being terribly salesy about it, the site is actually part of the very clever digital fundraising campaign for the RAF Benevolent Fund. 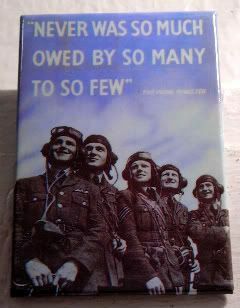 They have a fundraising spot featuring Winston Churchill, (sloooowly) talking about the speech he gave to the House of Commons, regarding progress of the Battle of Britain - which included the quote on this magnet. There's also a second microsite, where you can leave your Heartfelt Thanks to those in the RAF. Oh, it makes me sniffle! Seriously, I love this campaign. It's just well-done, all around. Of course, my first instinct was to check out who produced it - a digital agency called reading room. What a terrific project for that digital team to work on. It's not often that you're privileged to do great work for even greater causes, so cherish that.